Caswell County administrative offices are located at 144 Court Square, Yanceyville, NC 27379; phone: 336-694-4193. 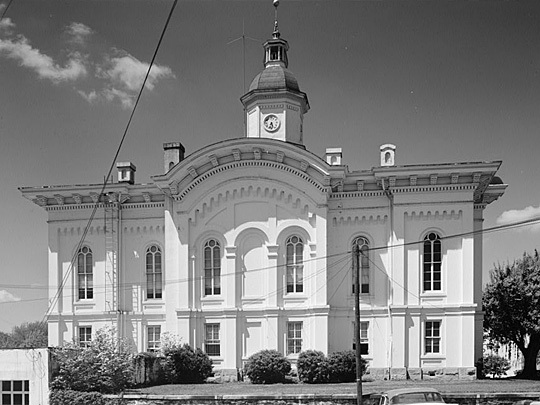 Photo: Caswell County Courthouse, Main Street, Yanceyville; photo by Jack E. Boucher, 1962, Historic American Buildings Survey [HABS NC-17], memory.loc.gov, accessed April, 2012. Caswell County, created out of Orange County in 1777 by the General Assembly of North Carolina, was divided in half in 1791 with the eastern half established as Person County and the western half remaining as Caswell County. Leasburg, the county seat, was abolished, and the sites of the new county seats were left up to the county justices. The Caswell County justices employed a Mr. Poston, a surveyor, to find the geographic center of the county, the new county seat site, and to lay off the "Public Lotts." As stipulated by the General Assembly, the first County Court of Pleas and Quarter Sessions after the establishment of the county in March, 1792, was held at Joseph Smith's tavern. The June and September court sessions of 1792 were also held there. The July, 1793 session met at "...the place appointed for the New Court House." John Graves, owner of this land, donated a portion of it for the courthouse. The court appointed Graves the "standard bearer" for the county, and ordered him to keep the official county weights and measures at his house, which must have been nearby. The county seat, called "Caswell Court House," developed very slowly. The first several county court sessions were kept busy establishing committees to lay off roads connecting the already established settlements with the new government center. As late as 1810, Bartlett Yancey, one of the most famous statesmen produced by the county, who was born and lived near Caswell Court House, wrote that "...the whole of the possessions there belong to Capt. John Graves and his Sons...." By this time, according to Yancey's calculations, the village contained "...2 taverns, a Store, a Hatter's Shop with about 15 houses...." The Caswell Academy, which had been chartered by the state in 1802, was located within one-fourth mile of town. Richmond and Petersburg served as markets for the village's produce. This embryonic period lasted until the early 1830s, when the county seat, reflecting the awakening of the county itself, entered a boom era which lasted until the Civil War. The April, 1831, session of county court approved a plan for a new courthouse, and by 1833 the building was substantially finished. In 1833 the heretofore nameless county seat was designated Yanceyville, in honor of the Yancey family. Dr. Allen Gunn, Thomas D. Johnston, John C. Harvey, Paul A. Haralson, and Colonel Thomas Graves were appointed town commissioners. North Carolina Division of Archives and History, Yanceyville Historic District, Caswell County, NC, nomination document, 1973, National Park Service, National Register of Historic Places, Washington, D.C.